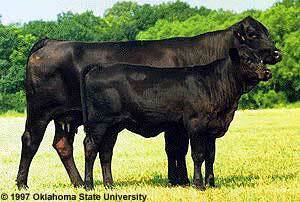 The Brangus breed was developed to utilize the superior traits of Angus and Brahman cattle. 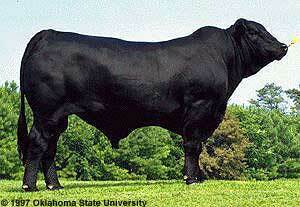 Their genetics are stabilized at 3/8 Brahman and 5/8 Angus. The combination results in a breed which unites the traits of two highly successful parent breeds. The Brahman, through rigorous natural selection, developed disease resistance, overall hardiness and outstanding maternal instincts. Angusare known for their superior carcass qualities. They are also extremely functional females which excel in both fertility and milking ability. The early breeders from 16 states and Canada met in Vinita, Oklahoma, on July 2, 1949, and organized the American Brangus Breeders Association, later renamed the International Brangus Breeders Association (IBBA), with headquarters in Kansas City, Missouri, and eventually San Antonio, Texas, where the permanent headquarters has been located since January, 1973. There are now members in nearly every state, Canada, Mexico, Australia, Central America, Argentina, and South Rhodesia in Africa. Registered Brangus must be 3/8 Brahman and 5/8 Angus, solid black and polled. Both sire and dam must be recorded with the International Brangus Breeders Association. Foundation Angus and Brahman cattle must be registered in their respective breed association prior to being enrolled with the IBBA. Intermediate crosses necessary to reach the 3/8 - 5/8 percentage are certified by the IBBA. In recent years, the major portion of the Brangus registered are from Brangus parents, but an increasing number of foundation Brahman and Angus are being enrolled as the breed achieves greater recognition. Interest in developing breeds of cattle carrying some percentage of Brahman breeding for the general improvement of the commercial cattle of the United States speaks well for the apparent advantages that Bos indicus cattle have in areas of high heat and humidity. Research at Louisiana has indicated that Brangus cows increased their weights during the summer months while Angus cows lost weight, indicating that they were more adapted to coastal climates. Calves from Brangus were heavier at birth and weaning and for total pounds produced per cow. The Angus had an advantage in conception rate and calved earlier, and the calves were more vigorous at birth and survived better to weaning. The breed have proven resistant to heat and high humidity. Under conditions of cool and cold climate they seem to produce enough hair for adequate protection. The cows are good mothers and the calves are usually of medium size at birth. The cattle respond well to conditions of abundant feed but have exhibited hardiness under conditions of stress. International Brangus Breeders Association, San Antonio, TX.